Cheryl J. 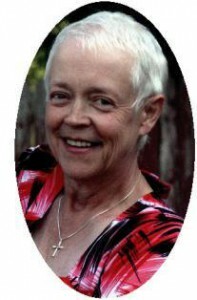 ‘Sherri’ Larson, 68, went to be with the Lord on March 9, 2013 at her Saukville home surrounded by family. She was born February 21, 1945 in Independence, Iowa to Fred and Irnola Sauer Cherry. In the mid 1970’s she came to Wisconsin settling in Saukville. She married Victor A. Larson of Hillsboro, North Dakota on April 11, 1986 in Port Washington, Wisconsin. Sherri worked as a machinist in the tool room at Doerr Electric for many years. She also worked as the bookkeeper for Congregation Shalom and more recently was a ticket taker at the Marcus Movie Theater in Saukville. She enjoyed reading, sewing and crafting. A social person she enjoyed meeting up with friends while having breakfast at the truck stop, fellowshipping with her church friends and going to movies with her husband. She also liked to travel and spend time with her family and grandchildren. She is survived by her husband Victor, children Tami (Dan) Staton of Grafton, Melissa “Misti” (Pat) Depies of Random Lake, Roger (Linda) Larson of Saukville, Karen (Steve) Buss of Sun Prairie, Wisconsin and Cindy (Tony) Blazek of Lodi, Wisconsin. Further survived by 15 grandchildren, 15 great-grandchildren, sister Sandi (Jim) Franck of Quasqueton, Iowa, her canine buddy Harley, other relatives and friends. She is preceded in death by her parents and sons Virgil and David Larson. Pastor Sid Lidtke will officiate memorial services 1 pm Saturday, March 16, 2013 at Open Door Bible Church, 3420 Highway LL, Port Washington. Family will receive friends from 10am until the time of service Saturday AT CHURCH. Memorials Wisconsin Ovarian Cancer Alliance (13825 W. National Avenue, New Berlin, WI 53151) or Open Door Bible Church appreciated.